I know this blog has been an ode to Baltimore lately, but hell, if I do nothing else in my time here I might as well try and convince the rest of you what a great place this is. Plus, when I was catching up on Southern Living yesterday I noted that they named Baltimore one of the top ten Southern food cities, so maybe my whole Baltimore-is-not-the-South stance is wrong after all and I should start backpedaling. Maybe. Anyway, one of the reasons Baltimore stole my heart in the first place is because of the parallels it shares with Durham. I always saw connections, but the more these two cities evolve the more wonderfully similar they become. One such example is the strengthening local, thoughtful, dynamic agriculture scenes. I see farms and collectives popping up all over the place in both cities, and I would be lying if said I wasn’t powerfully moved by it. The Museum started partnering with Kayam Farm, a local Jewish sustainable farm, about a year ago. Over the course of the past year we’ve worked together in many different ways, and I’ve learned quite a bit from them about biblical farming, sustainable living, and food justice. 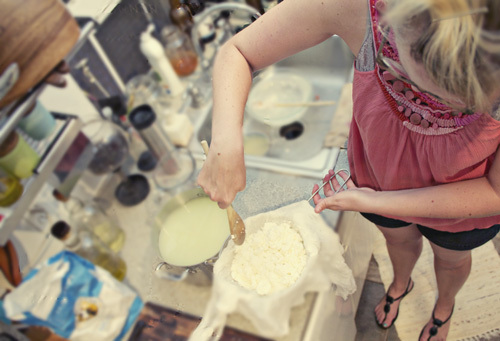 And, as of Thursday, cheese-making. We had them down for a First Thursday program where they demonstrated the technique for making a simple farmer’s cheese. Dan and I both left that night saying that we would be trying it at home as soon as possible. So yesterday afternoon, we did. The hardest part of the whole process was waiting for the gallon of milk to come to a boil. Other than that, it was stupid easy. I am a huge fan of recipes that are stupid easy. 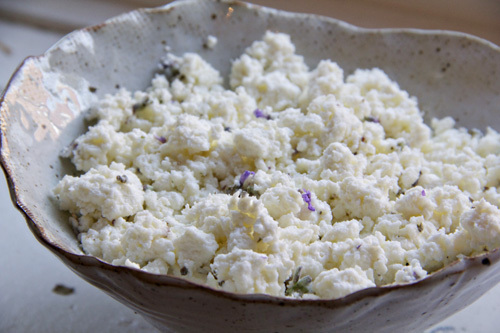 We flavored half of the cheese with fresh lavender and honey, and I have to say, it was delicious. I now feel empowered to move on to more complex cheeses. Chèvre, anyone? Ed note: this is what my kitchen looks like, really. It’s small, poorly lit, and messy. In a large, non-reactive pot, place your milk over low heat. 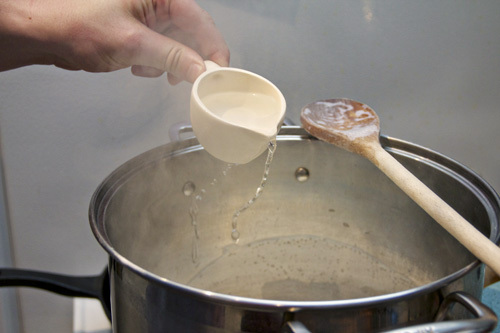 You want to bring the milk up to almost a boil without scalding it, so it’s important to heat it slowly. This will take what feels like forever. Heat the milk, stirring occasionally, until the pot is hot to the touch. Then you can crank the heat and stir the milk frequently until it begins to boil. When this happens cut the heat and stir in the vinegar. 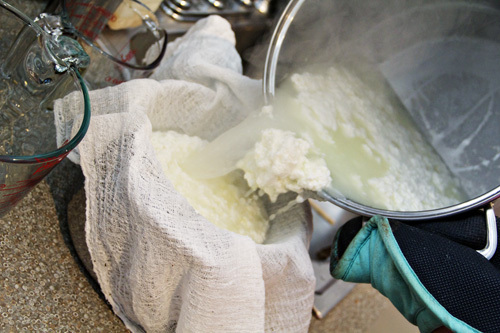 This will cause the curds to separate from the whey. Line a metal mesh colander with cheese cloth. Pour the whole mixture through, which will catch the curds. We suggest you hold onto the whey- it’s an incredible source of protein and I’ll be posting some whey-related recipes soon! 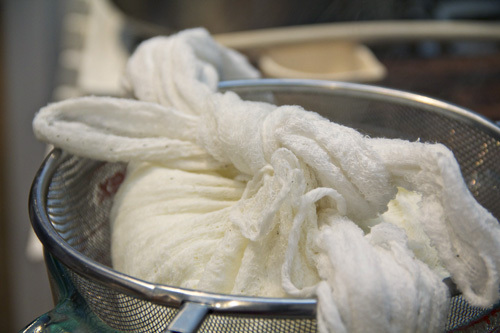 Allow the cheese to drain, tying the cheese cloth around it to promote drainage. When it is moist but not wet, stir in salt. 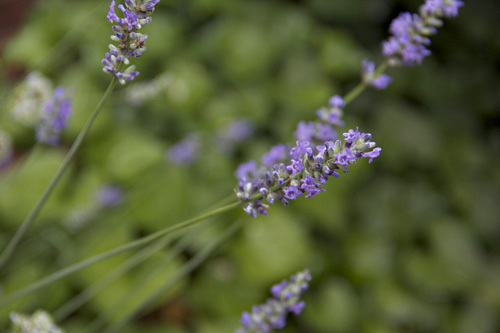 Transfer from the cloth to a small bowl and stir in lavender and honey. Serve or refrigerate for up to a week. I love it! 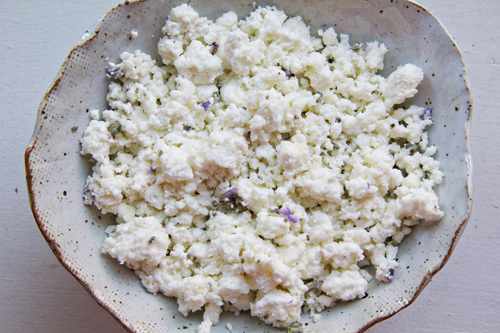 I made fresh cheese recently and used buttermilk. I’ve never tried it with vinegar.